I had to make my very first article on metal music, and some of you probably know why : before I decided to sing classical repertoire, I was a metal singer in a metal band for many years….but not only ! I also organised metal concerts, wrote articles in metal magazines, and posed for metal outfits…. You can’t believe it ? Yes, this is me ! And I must say : I enjoyed every bit of that period ! Being able to write my own songs, to share the stage with great musiciens every week-end, to record albums, to compose, to receive this energy from the audience singing along, responding to every claim, to be able to scream my heart out without being worried about “what will people think?”, to sing without being judged on my technic or anything else…. Some of you might have a very negative image on metalheads, and metal music. I can see why people think this way. It’s the way most of the medias present this community. 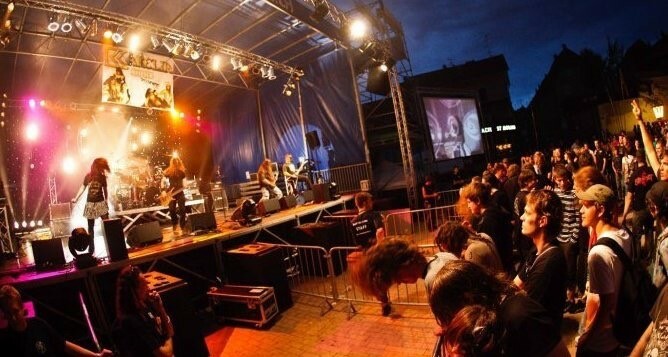 As a fact, compared to electro or rap festivals, metal festivals are the ones which need less the help of police or firemen : it’s more about drinking beer than taking drugs, and the violence is inside the music, not between the people. 2) Metalheads are nazis : There are some neo-nazis in the metal community. But it’s a minority, I’d say 3%. And it’s not the only type of music where you can find them by the way. As for the music itself, there is not only “one type of metal” : there are sooooooooo many, from melodic metal to rap metal, pirate metal or black metal…. So yes, you can find some very “noisy” metal, it can sound chaotic, and you will hear someone “screaming” (the exact word is “growling”), for instance in death metal or black metal…but you can also hear a very beautiful lyrical voice (Nightwish), or sing along with the singer of Metallica (big news : it is metal music!). You can even enjoy some cello with Apocalyptica !